Am Ende des "politisch barbarischten Jahrhunderts der Geschichte" (Prof. Robert Manne) möchte das australische Ensemble mit seinem Testament jene Freude wieder-erwecken, die Hirten tanzen lässt, wenn sie von Engeln inspiriert sind. Zarte engelhafte Gesänge mit Flöte, Geige, Mandoline, Harfe und Glocken wechseln mit beschwingten Rundtänzen zur Trommel. Weihnachtliche Musik aus dem Europa des 16. und 17. Jahrhunderts. Informatives, ästhetisches Begleitheft. Ein in jeder Hinsicht wertvolles Geschenk. The music on these two compact disks is concerned with connective aspects of angels (the celestial), shepherds (the terrestrial), and dancing circles (in the structures and arrangements of music and poetry, in dance formations, and so on) in an attempt to attain, in sound, Plato's "full bloom of joyfulness", as a formal declaration of the divine inspiration with which God has blessed our creative efforts. Many of the 33 tracks, but by no means all, refer specifically or obliquely to the angelically announced birth of Jesus Christ, divine prophet/son of God made man. What they all share is a structural reference to the circle—the magical/mystical formulation for celestial and terrestrial dance, the halo, the garland, the manifestation of God, the wheel (in the hierarchical order of divine beings), and so on. These circular manfestation are therefore metaphors for the divine inspiration to which this collection attests. This is thus a testament, a solemn declaration, of the indebtedness of shepherds to archangels, God's messengers and bearers of creative gifts, metamorphosed as a balanced, spiritual blend of the sacred and the secular, the religious and the proface, via game playing, convivial hospitality, and zig-zagging connections of opposites and likes. It has been important to us in 2000 to offer this testament as an affirmation of hope, for we have lived in what Robert Manne (Professor of Politics, Latrobe University, Melbourne) describes as "The most politically barbarous century of which history has record, (even though) it has been a time of unparalleled scientific, technological and economic accomplishment, where millions of humans, at least in the most prosperous parts of the world, came to live at a level of material comfort beyond the dreams of kings in previous times." Testament is a small gesture against scientific, technological and economic "advances" as a reminder of what the human imagination has been able to accomplish in the past and continues to do so untrammelled by "advances" in a simple creative environment of hope and belief. The Renaissance Players is the longest standing professional Early Music ensemble in Australia. Founded in 1967 by Winsome Evans, the ensemble is wellknown for its varied and imaginative concert programs which are presented in costume and enlivened by poetry, mime, dance and processions. They perform a wide range of music dating from the 9th century through contemporary folk and classical styles, using replicas of, and/or ethnically, authentic instruments where possible and attempting to reproduce performance styles appropriate to whatever music is played. 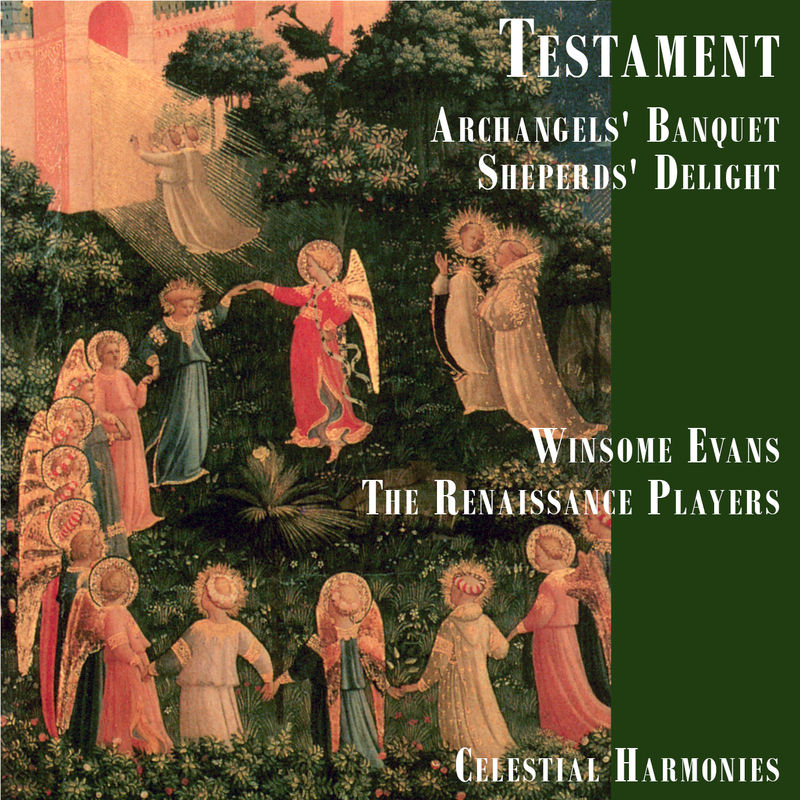 The Renaissance Players have a library of over 2,500 pieces, which have all been collected, arranged and/or composed by Winsome Evans. Director of the Renaissance Players, Winsome is also the producer of the fourvolume edition entitled The Sephardic Experience (19911). Aside from the performance and dance schedule of the Renaissance Players, she teaches music at the University of Sydney and is one of Australia's busiest harpsichordists. She has mastered an additional 25 wind, string, percussion and keyboard instruments. Professor Donald Peart, foundation Head of Music in the University of Sydney, and his successor Emeritus Professor Sir Peter Platt, are the patrons, or spiritual and intellectual guardians of the Renaissance Players.